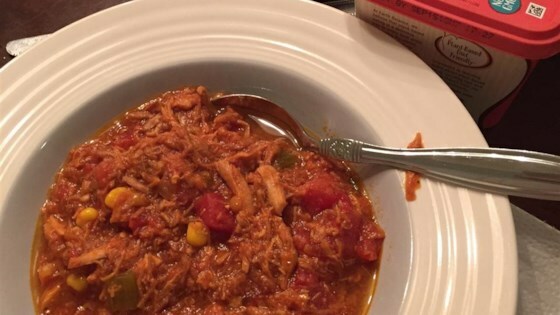 "The thickest, most wonderful Brunswick Stew you've ever had. Those of you who've never had Brunswick Stew will just die.... If you've had it before, you won't believe it. Old family recipe and the best stew around!!!" Heat the olive oil in a large skillet, and saute the onions and celery until soft. Mix in the pork and beef, and cook until evenly browned. Do not drain. Transfer the pork and beef mixture to a large stock pot over low heat. Stir in the shredded chicken, tomatoes and their liquid, ketchup, and barbeque sauce. Season with salt, pepper, and hot sauce. Place the whole green pepper into the mixture. Cook, stirring occasionally, 2 hours, or until thickened. Stir the cream style corn into the stew mixture. Continue cooking 1 hour, or to desired consistency. Remove the green pepper; chop and return to the stew or discard. Aw, shucks! It didn't get me a husband! I really prefer using beef, pork and chicken cubes, rather than the ground, and shredded meat. I often adapt this to my slow cooker.